Whenever I travel, a full restaurant is a trusted choice as a place to eat, and Solbar was packed for lunch. Savory scents lured me inside and triggered a rumble in my stomach. With so many options on the menu, I took my seat to scope out the dining room for a view of what others were eating. The answer: fish tacos. Alison Events’ is described as more than just a boutique event-planning firm. “We’re a global team with the creative capacity to design and execute an unforgettable party.” Principle of Alison Events, Alison Hotchkiss, reveals what goes into planning one of these unforgettable parties, giving us a closer look into how one bride and groom’s wedding vision was brought to life. Held in wine country amid Solage Resort’s unique, natural beauty and colored with vibrant hues inspired by the seasonal fruit, exotic spices, and textiles found at an Indian marketplace, this Sangeet (a celebration for Indian families prior to a traditional Indian wedding ceremony) is sure to give soon-to-weds inspiration and make romantic souls swoon. Planning a wedding is consumed with perfecting the sights, tastes, and sounds of your special day— but there’s one detail most couples overlook; the wedding’s signature scent. Fragrance is unique in its ability to conjure vivid memories and emotions, and its strong ties to ringing (wedding) bells make it the ultimate bespoke favor. 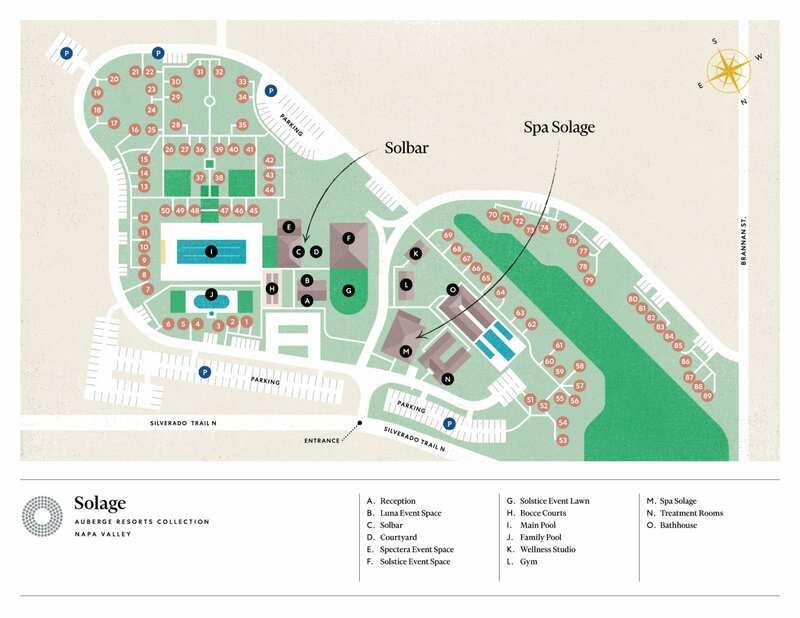 At Solage Resort, couples can personalize their own essential oil blend to capture the essence of their wedding date. The fragrance can then be gifted as a massage oil, body scrub, or lotion, bringing a whole new level of personalization to the wedding. If you’re planning on hiking Oat Hill Mine Trail, don’t let the weather deter you— foggy mornings are the best time for this hike. After stumbling upon this discovery by chance, the colder and mistier the morning in Napa Valley, the faster I grab my hiking shoes. Celebrate What’s In Our Wedding Emergency Kit? You’ve probably heard that dreams come true at a Solage wedding, but what you may not know is that putting on the perfect day is in part thanks to the special surprises planned for the bride and groom (shh… more on that later!) and the less-glamourous, but equally important wedding emergency kit. An unexpectedly perfect pair, digital detoxing while wine tasting offers the ideal afternoon at Solage Resort. Here, turn your wine tasting venture into a wellness retreat of sorts and leave your phone behind. An outing that is already so much about cherishing the present moment, wine tasting calls for clinking glasses with good company, appreciating world-renowned wines, and taking in views that photos cannot do justice. Besides using mineral-enriched mud personalized with essential oils, the Signature Mudslide includes a geothermal soak and an anti-gravity sound therapy chair. The best part? You’re not sharing your mud. Instead of a communal mud bath, expect a private, three-part detoxifying treatment that begins with mud combined with volcanic ash, geothermal mineral water, and essential oils you select yourself. Step into restorative bath experience— sans tub and bubbles. A “sound bath” is an ancient, healing practice where you can expect to stay dry, as the only thing you will be soaking in is healing sound frequencies.